It looks as this is probably the final list if a hidden WWk don’t show up. I still haven’t seen the one I heard rumours about. If it is big enough it can achieve minor changes depending on where it will hit. Dacia is secured but it’s only one level between PS and SPQR. X3 and Cerber is also tight and take turns on rank 4. I guess WINter and Animals is the ones it that it easiest to take down. [Dacia SW] zerofreeze made an attempt today to chief Tormentors WW village but failed. His hammer was far from enough. Both the Turkish meta and the Russians was divided this round, which made you the biggest working meta. What significance have that had for your victory? SPQR have been a buffer between you and the Russian Union in SouthWest. How do you evaluate their input for the outcome? WINter as enemy in your own quad. Your opinion about them? To win world finals you need the support of a big meta, there’s no other way and we’ve learned that lesson from the past. But in order to form a big meta and keep all leaders and their players engaged and motivated, well that’s the biggest challenge a leader can have. NW Meta created around Dacia had it’s own problems, we just faced them with a lot of patience and experience and somehow we’ve managed to arrive in endgame better prepared than anyone else. SPQR had a very important role to play this finals and they’ve done it very well. 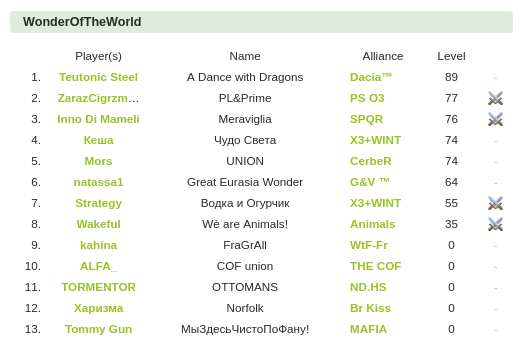 Before the start of the finals, I had several chats with Italian leaders and I knew exactly what will happen, I was also invited to come with Dacia in SW to have fun in that quadrant, but I decided to gather a strong team in NW and win the server instead. Italians helped Dacia without having direct motivation to do so, nevertheless Dacia had more defence than all other meta’s combined and more hammers than all the other metas combined also… so Italians did not make us winners, it was mainly our work and ability from the start to finish. NorthEast is weak for a while already, despite the fact that many strong players can be found in that quadrant, it must be due to lack of vision and leadership. 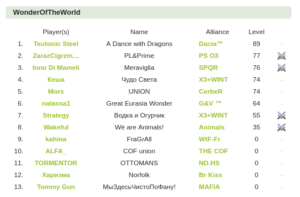 Rainbow Union was created just before the start of the finals and I’m sure the cooperation between alliances and groups inside this meta was poor. Lack of experience, lack of leadership and internal problems always leads to weak teams with poor motivation , hence poor results. Maybe next time, no ? Hard lesson are the best. Thank you all for playing this year’s Finals. Please keep the tournament active and honourable. Do not seek to cheat and manipulate ranks, but rather get yourself involved in epic wars between teams and meta’s. The reward and the experience gained might be worth investing your time and money, but cheating your way up to get some prizes will only bring shame. As I understand you have been an independent Germany based smaller meta in NorthEast. Why did you choose to not cooperate with Gallia? Well, we are not a meta, we are just a bunch of 90 acc in 2 German allys. We decided playing this finals without any meta and naps. Fun was priority for us. So there was never an issue to join a meta. Well … I think the metas in our quad wasn’t clear to work together ,so we could successful disturb. Yes …. because they are well organised and it helped haven’t got a big opponent in the quad. 4.They are 2 experienced metas and equalise one another. I think they got fun too. 5 . Polen and Prime was for me the biggest surprise this finals. But we are too far away to say something why the Rainbow Union didn’t make it. I wish you a great summer and will see you next finals. This have been your first round in the Tournament. You had hard fights against Turkey in your qualification but survived with many accounts (not usual for that qual). You have showed that you can be counted with in Final. What is the biggest cause to your success? From your forum I have understand that the feelings between PS, PT and nTPl isn’t the bests. Why? You chose to cooperate with Prime to build your WW. What to you think about them? Your opinion why The Rainbow Union (Turks, Arabs, China, Vietnam) did such a bleak input in the Final? You had a border war against BAD. Your opinion about them? PS Coalition in the elimination round concentrated mainly on cooperation and reaching Polish players who usually played against each other. We tried to introduce as many of them to the finals. We also had the foundations to build a miracle, but winning on the server wasn’t a priority for us. Therefore, we were able to get the entry codes for the final server for most players facing a large number of enemy. Many times we played against each other on Polish servers, hence many unexplained matters between us, and we each had different goals for the server. PS – came to build a miracle, nTPl – fight with everyone in his style, PT – nobody knows why they came. and they have their share in our result. There was no cooperation with the PT alliance, they cut themselves off from our miracle – on which side they played – remains a mystery. We are very happy with the cooperation with Prime. We regret that we did not start cooperation earlier, from the beginning of the server. we could plan for example a settlement zone, and common strategies from the beginning of the server. Nevertheless, we have achieved a good result here. Anyone can wish for such a good coalition as Prime, they did not disappoint us in any way. Certainly impact was that they had internal problems and splits, but it does not change the fact that they had two times the advantage of accounts in the quadrant and not have coped. This is confirmed by what we have already seen in the qualifying rounds – they can make nice offs, if they have calm, but in the fight for short distance does not cope, also they look poorly when it comes to def. BAD miscalculated themselves on this server, they hit them in the quadrant, the well-organized Italian, and their attention focused on the main burden of fighting onto this front. Cross-border battles with us were for them a secondary front. On these fight PS lost a lot – above all, the lack of a stable situation and using the potential of off in the direction of which did not give real strategic benefits. From the point of view of the server layout, a much better solution for both parties would be NAP, not mutual destruction. Maybe there would be chances in this situation, to oppose the victorious coalition. I think that both they and us , we did not appreciate the strength of Dacia and friends. It does not change the fact that despite the weaker performance, the CeBad coalition is still a serious opponent for everyone. And certainly as we did not say the last word. Maybe next year will be better. 6.Yours commitment, time devoted to the game, gold,resources and yours def, it all contributed to this that we’ve come so high. You can tell with a clear conscience – we played a good server.